In the wake of today's stage collapse at the Belgium music festival Pukkelpop, musicians have taken to Twitter to express their condolences and thoughts about the tragedy. A list of responses can be found below–but feel free to add others in the comments. @benjybenjy Want everyone to know that Wiz and the rest of our crew are ok. 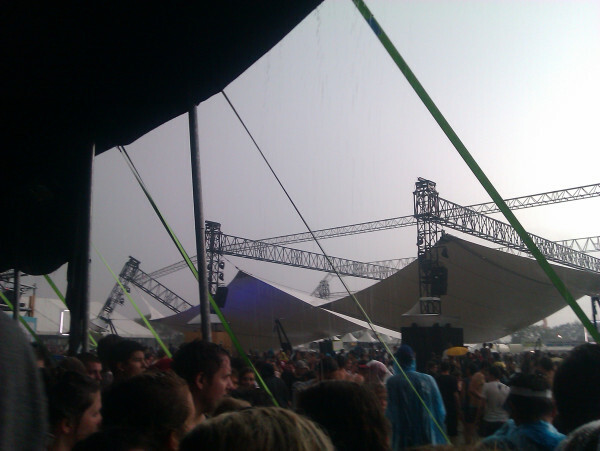 Stage next to Wiz's at Pukkelpop Festival collapsed as Wiz was performing. @fleetfoxes We are all safe at Pukkelpop. Crazy storm. This is awful. Hearts go out to all. @fleetfoxes Our hearts go out to all who lost their lives or were injured in today's storm at Pukkelpop. This is not how it should be. Oof. @theantlers so the stage we're supposed to play tomorrow at Pukkelpop collapsed and people were killed. our hearts go out to everyone there. @gallowsofficial Shocked and saddened to hear about what's happened at Pukkelpop festival today. @benjaminmadden Sad day here at Pukkelpop. One of our favorite festival to play. Sad this happened today. Hearts are with the victims here today. @BRMCofficial Our hearts go out to everyone at Pukkelpop – the fans, bands, and crews. @MayerHawthorne And now I am saddened by the tragic news of a fatal stage collapse at Pukkelpop festival today. I am not yet sure if we will perform tmrw. @jacobplantmusic just go caught in the tornado in “pukkelpop”!! 2 tents came down i was in one just managed to get out!!! It's mad out here! @ENTERSHAKIRI sad news from Pukkelpop. hope any of our friends who were there are staying safe. @localnatives Our hearts go out to all those over at Pukkelpop and to the families of the people lost. Tragic day for such a wonderful festival. @Architectsuk Our thoughts are with everyone at Pukkelpop festival. Such an awful thing to happen. @TheRealIngrosso Pukkelpop so sad my heart goes out to all the victims. It has just come to our attention about the tragic events that took place at Pukkelpop after we lft the festival 2day. Our condolences To the Families of the victims of this happening, and our prayers to people that were injured. We found out shortly after our thank you message had been posted. Our sincerest apologies to our supporters that We may have caused offense to. We are on the road and often information gets passed on later than we would like. We are all deeply effected by the news. @crystalfighters our thoughts with everyone at Pukkelpop..
@Skrillex All my friends, @the_roadhog and I are okay… But my heart goes to the lives lost today at Pukkelpop. @Veara Hey! We are SAFE! Theyre some injured today at Pukkelpop by the storm and we will keep our thoughts with them. @EAJosh Hope everyone at Pukkelpop is okay. Crazy stuff. Damn. @travishead 2011…The year of the stage collapse.